You may be wondering . I am going to break down the differences between the different ones available with this Instant Pot models comparison guide. Instant Pot Models Comparison – Which Instant Pot Should I Buy? 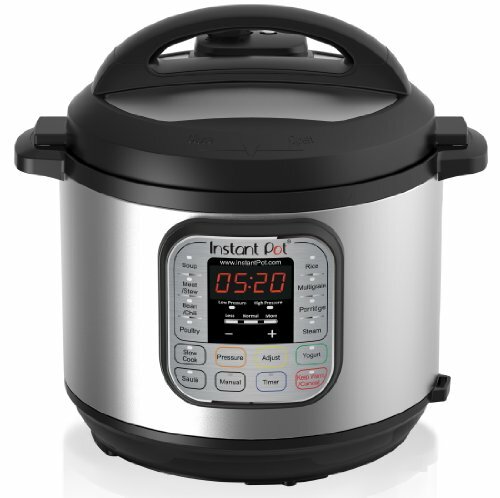 There are so many different Instant Pot models and brands of electric pressure cookers and multi cookers out there, it can get confusing and fast. 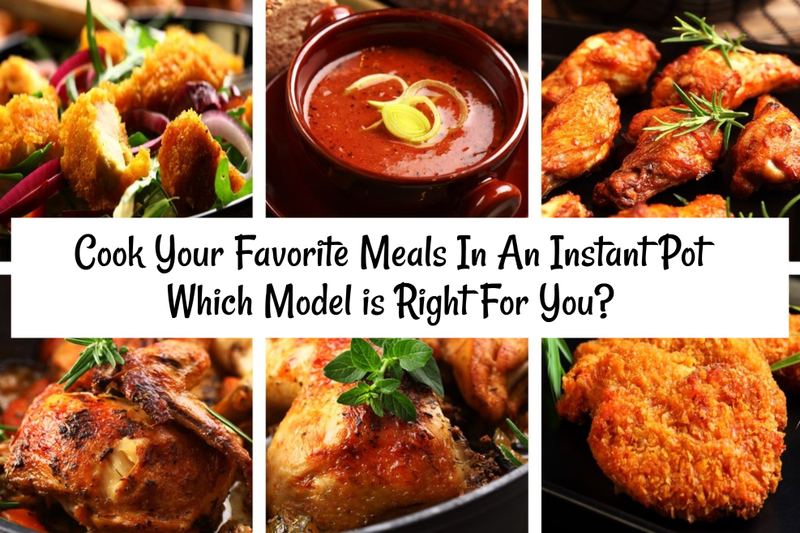 If you are wondering exactly what can you do with an Instant Pot, let me help showcase each model and the features offered. This is a comparison guide that will give you all the information you need to help decide which electric pressure cooker to buy. While there are tons of styles and brands, the Instant Pot is the brand that offers quality and variety and chosen by most. The Duo is one of the most popular models because it offers seven different functions. It can be used for pressure cooking, slow cooking, saute or browning, rice, steamer, yogurt and even as a warmer. 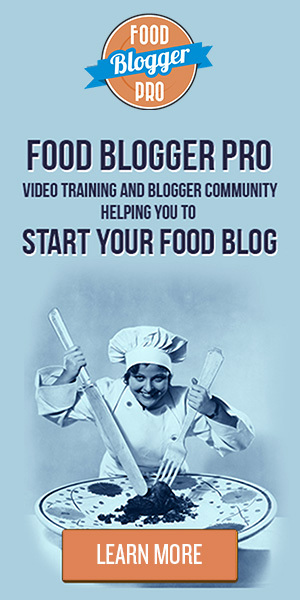 This is an excellent option is you can choose low or high on pressure cooking, which comes in handy for many recipes of being able to do low pressure for your more delicate foods. Some like to buy the Lux model as it is the most affordable, but it doesn’t have all the features as the Duo or other models. You can not make yogurt with this, and there is no low-pressure mode which means some dishes will overcook and break down on the high-pressure settings. Most of the time people recommend skipping this model, but some people don’t mind that they don’t offer those features and deal with it. It all depends on what you plan to cook. If you like to cook delicate foods then the Lux model may not be the one for you. The Ultra is a newer model, and it offers a new interface that is updated from other models and offers a control dial. You have the egg, cake and sterilizer mode like in the Duo Plus 9-in-1. The lid will seal itself when you close it, so you don’t have to do it manually like other models. One other awesome feature on this one is you can choose the temperature you want to cook your dish, and for some recipes, it might be pretty handy. 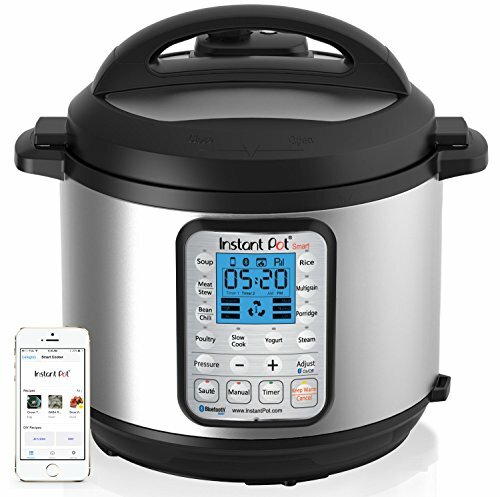 The Smart model is pretty high tech, it allows you to connect to Bluetooth where you can run your Instant Pot from your phone or tablet. You can make your selection and monitor the cooking from your phone. It has all the same features as the seven functions like the Duo and then offers a downloadable recipe program, and then you get an added three temperature setting option. The most significant perk of buying this is the Bluetooth option for those who are into having higher tech appliances. Now that I helped you with the Instant Pot models comparison let’s talk about the sizing options! The Instant pot comes in four different sizes. This is great to find the model and size that fits your family’s needs. You can get a 3-quart, 5-quart, 6-quart, and 8-quart. Now not all sizes are available in every single model, it seems like Instant Pot is working hard at providing more options for their customers, so maybe soon all sizes will be available. 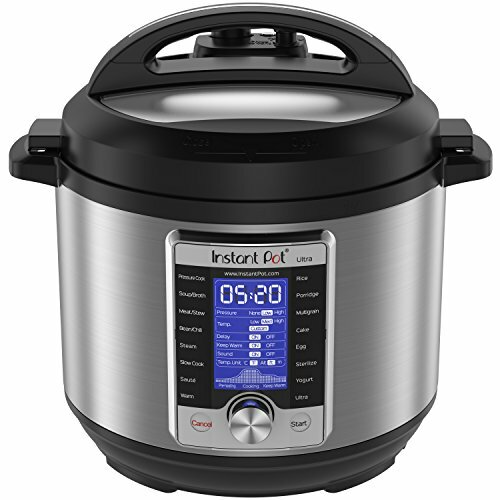 Out of all the models and sizes, the Instant Pot 6-quart Duo Plus is one of the most purchased models. It seems to be a great size with great functions. One thing to keep in mind when buying an Instant Pot you will never fill it to the top to cook. The food needs room to boil, expand, stirring, and so on. A friend told me once when you consider buying, always buy bigger than what you think. It’s better to have more space than not enough. 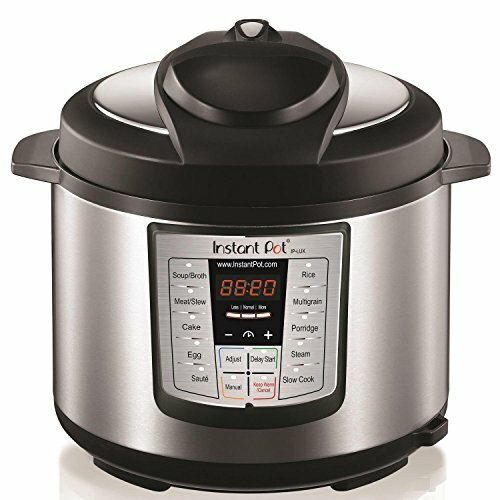 Which Size Instant Pot Do I Need? Is a 6 Quart Big Enough for a Family of 4? When making Instant Pot Comparisons you really need to look at your family, if there is just one or two, maybe a 3-quart is a great size, or if you have a larger family, you might go for the 8 quarts. I recommend if you have four family members or more, buy the 8 quarts so you can cook delicious recipes to feed the family. If you are thinking to cook roasts, whole chickens, cheesecakes, spaghetti squash I recommend a size 6 or 8 quart. You can do a smaller sized chicken or small to medium size spaghetti squash in a 6 quart. If you want a more substantial size chicken or multiple spaghetti squashes go for the 8 quarts. With cheesecake you should also go with the 8 quart. If you like to batch cook extra food then go for a 6 or 8 quart. If you have a larger family, I recommend an 8. This is also good for other dishes like soup, yogurt, and desserts. If you plan to use your Instant Pot to make homemade yogurt buy a 6 or 8 quart. The 6 quart makes around 4-5 quarts. You have to remember that you can’t cook any dish all the way full in the Instant Pot. Having a larger size than what you will make will allow for space. If you like to cook large batches of eggs, a 6 quart can hold up to 4 dozen eggs. That is a lot of eggs, but it also can give you a good idea of the size. If you like making your bone broth a 6-quart size will let you make around 3 quarts. An 8-quart gives you around 4 quarts. Steel cut oats are a huge breakfast dish, so any size is great for making oats. A 3-quart will make around 1- 1/2 cups, a 6 quart around 4 cups, and eight around 5-6 cups. Another great thing to consider while doing your Instant Pot models comparison is accessories! If you want pans that stack, cheesecake pans, glass containers for flan, etc., reach for a 6 or 8 quart. Many items on the market will fit the 6 or 8, the 5 and 3 are too small. 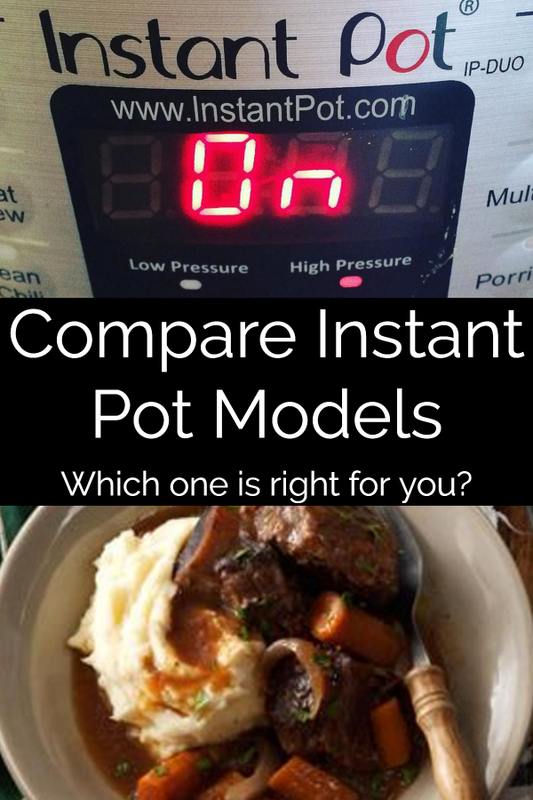 Compare Instant Pot Models: Share this post or pin for later.